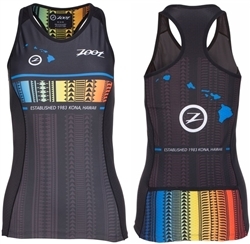 Inspired by Kona, Hawaii, home of the triathlon World Championships and birth place of Zoot Sports, the Ali'i Racerback brings a fresh look to triathlon. Race day ready and packed with performance, this racerback has been perfected for both racing and training. Sublimated Italian fabric ensures the best in moisture management, comfort and durability. Three rear nutrition pockets provide adequate room for your nutrition needs. 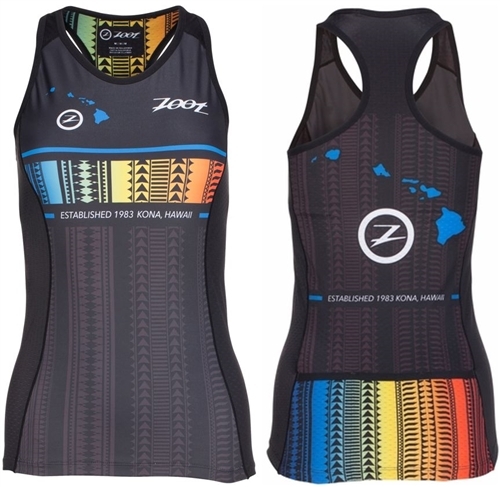 Designed for Zoot by Keith Tallett, a mixed media artist, born and raised on the Big Island of Hawaii. Sublimated Italian fabric ensures the very best in moisture management, comfort and durability. Built-in bra for integrated support and performance. Racerback for maximum range of motion. Three back pockets for nutrition storage. Dropped back hem for enhanced coverage. Seamlink stitch construction ensures next-to-skin comfort, minimizes chafing and stretches with fabric.